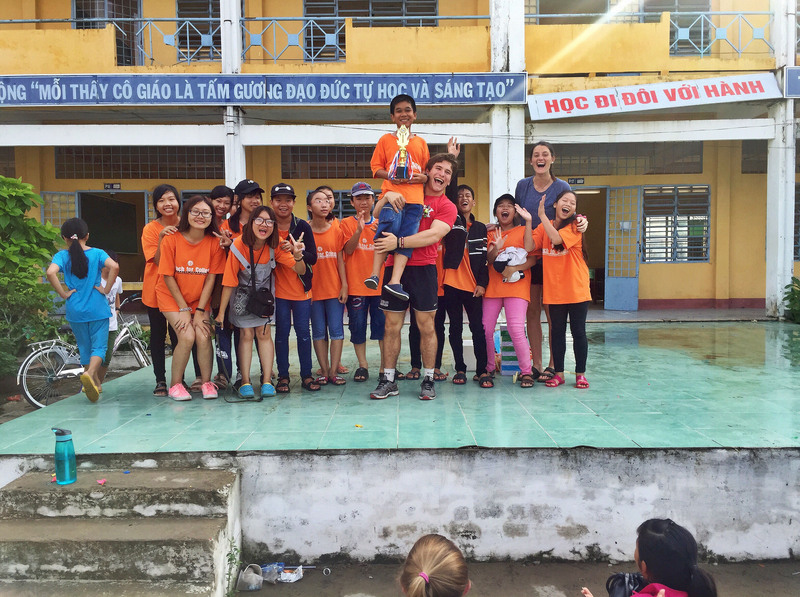 Coach for College is a service learning program that brings together US student-athletes and Vietnamese university students to teach academics, sports, and life skills to children in rural Vietnam. 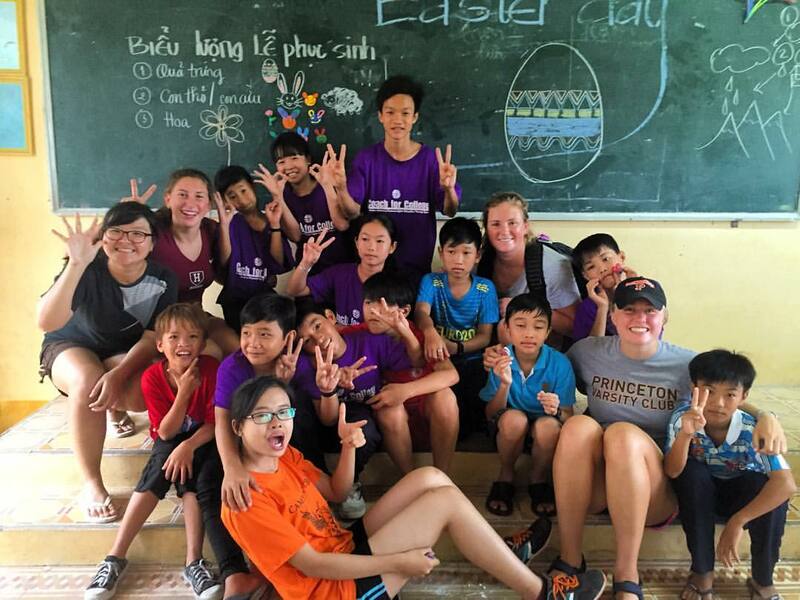 The Harvard Varsity Club supports Coach for College because we believe in the impact the program has on the lives of both Vietnamese youth and our student-athletes who benefit from a truly transformational experience. We also believe that Harvard student-athletes are uniquely positioned to impact the lives of young students through sports and education, and that when you have the opportunity to put a Harvard ‘H’ on your chest, you have a responsibility to give back. Each summer, through the generosity of Paul '52 and Harriet Weissman, the Weissman Foundation fully funds a number of Harvard student-athletes to participate in the Coach for College program. Below are essays written by our student-athletes who participated in Coach for College during the summer of 2016. To view reflections from 2015, click here. To find out more about the program, attend the Sport & Social Impact Information Session on Wednesday, November 30 and visit the Coach for College website. For information on the application process and deadlines, visit the Coach for College page within the Office of Career Services website. Note - the application deadline is Jan 23, 2017 @ 5 pm. Going into this program, I had expectations surrounding the logistical side of the experience, but I never imagined the kinds of connections that could be formed across languages and cultures in just a short three-and-a-half-week period. On a professional level, I appreciated the collaborative environment of the Coach for College program, encouraging and necessitating work between Vietnamese and American University students to run the camps. While supervised by directors, as coaches and teachers we were given a great deal of freedom and responsibility to run the camps and the curriculum in creative ways. The skills we gained collaborating, designing curriculum, resolving conflicts, and working together in the classroom and on the field are going to be extremely valuable going forward in my life and career. It is a skill to be able to work with people with different personalities or backgrounds, but this program provided me with a rare experience to be able to expand those collaboration skills with people of another culture and language. I have interest in working abroad in international development in the future, and I know that the experience I gained with Coach for College this summer will help tremendously moving forward. From a personal career standpoint, I’ve always loved coaching, but this was my first time teaching in a classroom and I absolutely loved it. Working with kids in a classroom, but in a larger international development context is something I am extremely interested in pursuing. I don't know what my career will look like in the years after college, but whatever it is, Coach for College showed me that travel, working with people across cultures, and youth development are all crucial parts of my future. The whole program of Coach for College is a unique and immersive cultural experience in itself. 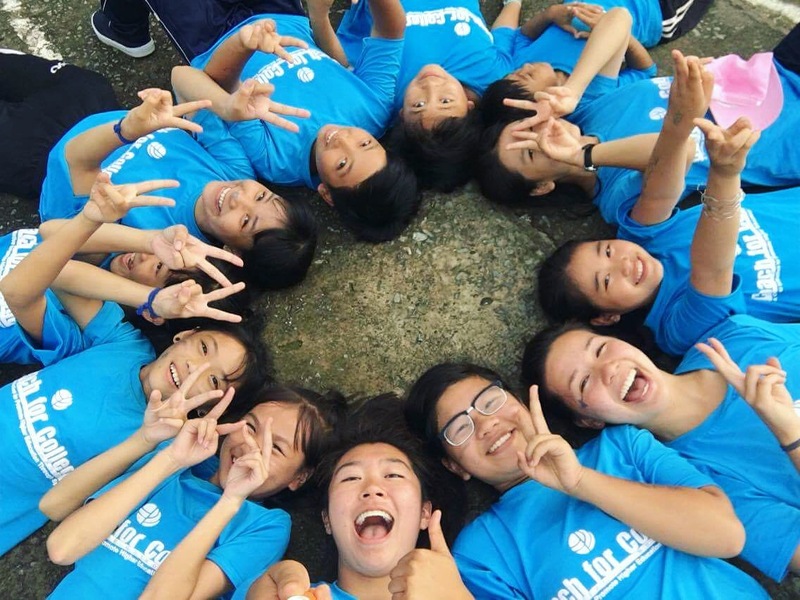 We work, eat, travel, and live with local Vietnamese University students for three and a half weeks, and spend 8-10 hours every day working with 6th and 7th grade Vietnamese students from in rural southern Vietnam. From the first day, as coaches and teachers we are immersed in the culture of Vietnam and interacted with locals constantly, which in my opinion was the best part of the experience. On the weekends we would take trips, accompanied by the Vietnamese University students, to different places in Vietnam, including the southern coast and the city of Can Tho. We were able to take part in some amazing experiences such as exploring cities of Can Tho and Ho Chi Minh, bargaining at markets, eating all kinds of local fruits and foods, spelunking in caves, walking through rice fields, and even participating in very popular Vietnamese Karaoke. While there were other American university students in my program, a challenge I faced throughout the trip was adjusting to an uncomfortable environment without people you know. All the travel I have done before this point has been with at least one person I know, so coming into this program without any familiar faces was a challenge at the beginning. Another challenge was building relationships with the young students we were teaching, despite the very strong language barrier between us. The Vietnamese university students acted as our translators, but we still had to find ways to build bonds with these students on our own. This challenge taught me the importance and strength of non-verbal communication. There were many benefits I took from my experience with Coach for College but one of the main things I will take with me returning to Harvard and choosing classes and activities this fall is the education and international development focus of this experience. I loved working in the classroom and realized the opportunities that education can provide for kids all over the world. I want to have an education focus in my studies and activities moving forward, and work and study to provide equal educational opportunity. I would like to extend my deepest gratitude to the Weissman Family for their generosity in providing the funding for this incredible opportunity. Your investment in the lives, development, and futures of Harvard students is inspiring and gracious. This experience was more than I could’ve imagined, and I hope that I made a small difference in the kid’s lives, because they certainly made a difference in mine. You are giving us an opportunity to change the world for the better and I hope you know how profound that is for each one of us interns. Thank you. I was nervous going to Vietnam to teach physics and coach soccer to eighth and ninth graders. I had teaching experience from the year before and I had just taken a course on the US education system. Neither of those experiences helped calm my nerves. I wanted to become a high school physics teacher, but I still felt insecure about my lack of experience and education on the topic—not to mention I had never been close to Vietnam and I knew little about the country. I kept wondering if I would have a similar experience to the summer before. Will these students learn from me? Will I learn from the students? Will it be fun? Will we have a connection with each other? I learned that the differences in culture between me and my students was not a barrier to learning and was not a barrier to building connections. We had so much to learn from each other. I had the time of my life. This experience confirmed my career choice and it also pushed me to look at how my academics can teach me about education in other cultures. 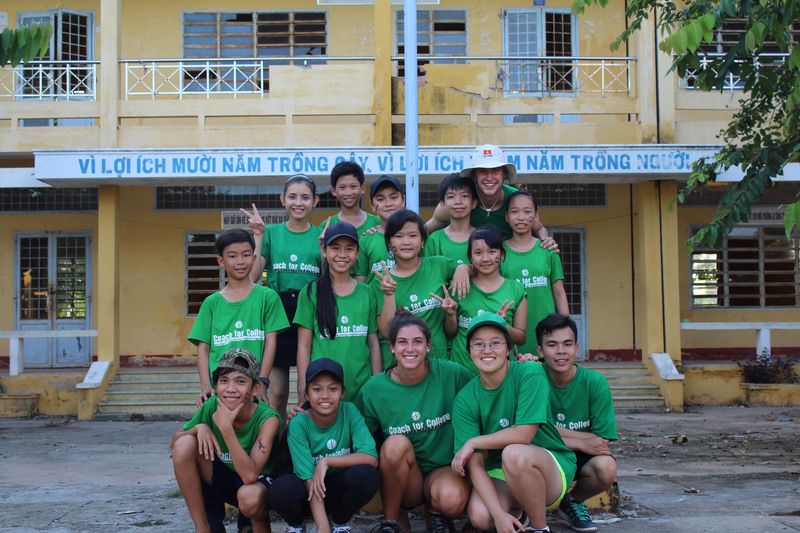 Coach for College has inspired me to pursue the best academics and the best career paths so that I can connect with more groups of people like I connected with my class in Vietnam. Outside of the program, I got to go to a karaoke skyscraper, run across gorgeous landscapes, and share so many smiles with local people. Karaoke is so big in Vietnam there are businesses that devote floors upon floors of nothing but rooms where you can order food and drinks and sing karaoke with a group. I had the chance to go to one of them with Vietnamese college students and American college students. Dancing and singing to Taylor Swift, Michael Jackson, and Vietnamese pop songs were so much fun. I had the chance to sing one of my favorite Vietnamese songs, “Một Nhà” (which means one house) with my fellow coaches. The only time I was not with the other coaches was when I went on runs in the mornings. These times were brutally humid and hot, but serene with the beautiful sunrises and landscapes. On these runs I would pass farmers in the rice fields and they would always smile and wave at me. Everything in Vietnam—even just walking across the street with dozens of mopeds and street vendors—was a new cultural experience for me. The greatest cultural experience of this program was working with the Vietnamese college students and the eighth and ninth grade students. I learned to count and to do basic math in Vietnamese from the Vietnamese college students so that I could use it during my physics lessons. I learned about Vietnamese food, songs, and dances. I learned how rice is grown and I got to visit the rice farms my students lived and worked on. I got to break sugar cane and have fresh sugar cane juice with my students. I had the best mangoes I have ever had. Playing soccer in the mud and volleyball and baseball until sunset with the whole camp will be some of my favorite memories ever. The activities outside of the camp were fun, but the times working and playing at the camp were some of the best days of my life. 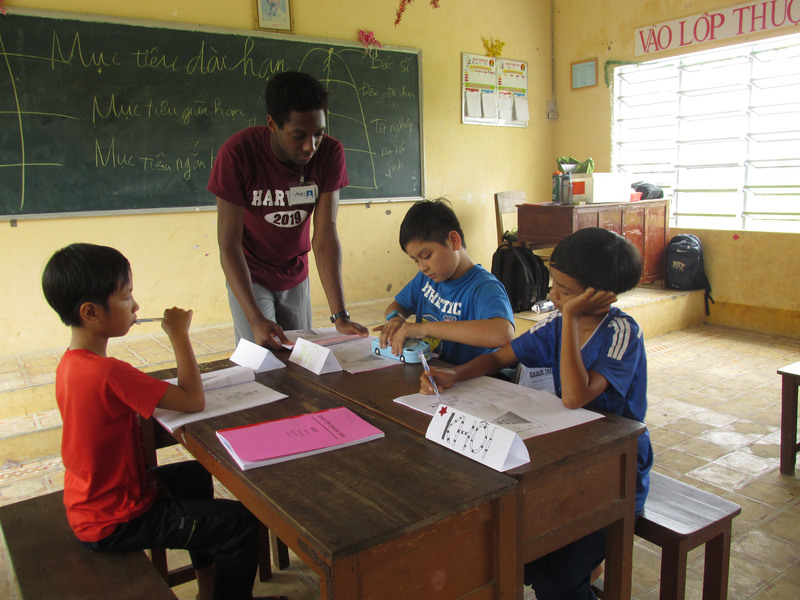 I learned that my students had difficulty travelling to school and affording to continue their education. This was the biggest challenge for me. My students were frustrated that they did not know if they could go to school the following day. One of my students gave me a friendship bracelet she made halfway through thinking she might not be able to travel to our free camp the next day. Another one of my students cried after placing last place in volleyball because he wanted to do so well at this opportunity he may never have again. We talked to the parents, but all we could do was teach as much as we could and have as much fun as we could each day. The last day and the last goodbye were very difficult. I miss Vietnam. I had a bigger culture shock coming back to the US than going to Vietnam. I came back and the cars, food, and conversations all felt strange to me. However, I have learned so much from my time across the world. This experience is a big inspiration for me to become the best teacher that I can become. Thank you Harriet and Paul Weissman. You have given me some of the best days of my life and I am extremely grateful for your kindness and generosity. I hope you enjoy the stories I have shared and I hope you know how meaningful this experience was for me. I'd hoped to meet some children who I might be able to influence as positively and memorably as the great mentors of my own life, and to some degree I think I succeeded. I remain in regular contact with both colleagues and students in Vietnam, and my eighth- and ninth-grade students still talk about our lessons. The class had great fun during my animated physics demonstrations, from deriving the gravitational constant by dropping mangos from roofs to teaching students to act out the behavior of electrons in a resistor circuit. After all, peculiarity is the best tool to make something memorable. And America’s great tradition in physics was built on the backs of bizarre teachers, so perhaps this is something we ought to impart. However, perhaps unsurprisingly, the most significant lessons were probably not subject-specific. Ideas like creative thinking and pride in individual accomplishments (which, though certainly not foreign, are less emphasized in Vietnam) will be far more lasting, I suspect. Vietnamese culture came with some shock. Within the first week I’d ordered durian (a fruit you can smell from a mile away), hu tieu (bone soup), and balut (a nearly hatched duck egg). But within a matter of days I’d begun to enjoy the unique traditions of my Vietnamese hosts. With the help of friendly locals, we traveled to a Buddhist temple carved into an ocean cave and walked barefoot through a rice paddy, gathering pounds of snails for dinner. My students were the most important part of the trip, but a few in particular stand out. One was a thirteen year-old girl named Tran. She had an unforgettable smile, happy and real but always a bit wry, as if she knew a secret you were yet to be in on. One damp afternoon she let me behind her wall of poise, when I asked who her greatest role model was. I asked passingly, not expecting much of an answer. The last four students had all said Ho Chi Minh and looked confused when I pressed further. But, after some thought, Tran replied with a story about Linh, her quiet classmate whom I had met. Her parents died suddenly when she was nine, both to sickness. She lived with her grandmother for the next two years, only to watch her grandmother stuck and killed by a car. She spent the next year living alone, finding shelter where she could and selling wild strawberries to earn money. At last, with some help from authorities, she was at last taken in by a local family. But Tran, with tears on her face, told me that her friend still considered herself lucky and had resolved to earn a college education in memory of her family. After that, I suppose Linh became a role model to me too. I loved my time in Vietnam. Of course, the most significant part of the experience was the lasting friendships I formed with Vietnamese officials and students. Strengthening international ties is, after all, a primary mission of international fellowships. I now have a broader appreciation of how different cultures influence each other, as well as how certain American traditions have been adopted into global culture. Working in Vietnam has strengthened my desire to contribute to health policy, since physical health for most Vietnamese citizens is limited not by technical deficiencies but simply access to good treatments. I am tremendously grateful to Paul and Harriet Weissman for their generosity, without which the trip would have been impossible. Their hard work and foresight are felt not just by Harvard students but by families around the world. I am not really sure what one expects when they are headed to Vietnam. Looking back, I believe my mind was relatively open to whatever was headed my way. All that I was told was that I would be living in rural Vietnam for three weeks to teach math and coach baseball. I guess, after initial contemplation, the picture I formed in my mind was one of a small village of around 200 people where people lived in huts, began their day before the sun was up, worked primarily in rice fields, rode bicycles everywhere, and lived a very simple lifestyle. I never contemplated the classroom aspect, but I did have my Dad ship my baseball glove to me from home so that I would not have to use the old clunky mitts Coach for College would provide. While some of this image was wildly inaccurate, it was not completely untrue. Most people in Vietnam do live a very simple lifestyle, many do work in rice fields or sell their own produce at the town market, and I felt like life in Vietnam started for many around 5 a.m as I anticipated. Moreover, the kids we taught typically owned only about 4 or 5 shirts, washed their laundry in the canals, ran barefoot on concrete, and slept in one to two room houses with their family. However, while definitely rural, the town was more on the size of five or six thousand; and though many houses were thatched walls with corrugated tin roofs, I would not go as far as to consider them huts. Also, everyone in Vietnam owns a moped, scooter, motorcycle, or the like. It was insane to see the hoards of motorbikes flowing relatively seamlessly through the streets on our first night in Ho-Chi Minh. I think the biggest inconsistency between my thinking and reality was on the baseball field—or more accurately: the volleyball court we played on diagonally to best avoid the poles and trees. I was completely unaware of this until I got there, but no one in Vietnam really knows what baseball is, let alone has played it and understands the rules. My mitt was completely useless except as an object for show-and-tell because we were actually playing whiffle ball. It was honestly somewhat amusing to reflect on what I was expecting out of baseball, and what was reality. Something I had never had to do before was explain the rules of baseball from ground zero…and I would be lying if I said it went well the first time through. The first time my American co-coach and I tried to explain the game, we forgot that not only were we explaining baseball to a group of 8th graders, we were explaining it through our Vietnamese co-coaches who also did not know the rules. Needless to say, it was a confusing mess and the kids were painstakingly bored. It was a great lesson for us as coaches though, and we when we returned to our guest house that night we hashed out a strategy for explaining it to the kids—bringing a whiteboard out to the field was key—and we started by explaining as much as we could to our Vietnamese co-coaches. That initial challenge was both frustrating and very rewarding to overcome. In fact, there were three sports being taught by the program (baseball, soccer, and basketball), and by the end of the three weeks, it was baseball that the kids were able to execute best. On the other side of things, I did not think much about what teaching math would be like beforehand. Part of me wants to be a college coach, but I had never taught or considered teaching before—I was very nervous. The area right below the chalkboard in Vietnamese classrooms is raised about 2 feet above the rest of the classroom, and stepping up there on the first day of teaching was absolutely terrifying. By the end of that first class, however, I knew the classroom would be a place I greatly enjoyed by the end of camp. And as the weeks progressed, teaching became more and more fun. The challenge of figuring out how to teach each day’s lesson in the most fun and understandable way possible was incredibly engaging. An additional challenge was working with our Vietnamese co-coaches. It was sometimes difficult for them to accurately express themselves in English, and we learned endless patience over the course of the camp. We also had to work around Vietnamese cultural dos and don’ts, many of which we didn’t see coming i.e. don’t toss candy to kids as a reward. Teaching was so rewarding in fact, that I am actually considering it in some capacity post-college. To what extent or area, I’m not sure, but I miss it dearly already. Returning to the states and to Harvard this fall, it has been immediately apparent just how much perspective I gained and how much I grew as a person in Vietnam. Those kids showed up every day so happy to see us and so happy to learn, it is impossible for me to not carry that enthusiasm with me in every facet of my life. We take so much for granted in the States, it was incredibly humbling to witness their incredible energy despite their lack of, say, a real shower. They also didn’t speak any English, which was very challenging at first, but made us connect with them on a different level. A level, I think, that was more important and special in the end. Through them, I believe I have truly learned the meaning behind “actions speak louder than words.” Overall, this entire experience has helped me realize just how much I value learning about and being exposed to cultures from across the globe. Leading up to this year, many of my classes have unintentionally focused on varying parts of the world, but for the coming years, I am trying to intentionally ensure that I expand my coursework to include snippets from multiple cultures. Furthermore, it has reinforced my urge to give back and help others in any capacity available. My experience in Vietnam with Coach for College is one that I cherish and have carried with me every day since. It was something I never anticipated doing, let alone having the opportunity to do. As such, I am forever grateful for the generosity of Harriet and Paul Weissman. This summer changed my life for the better, and without them it would not have been possible. Thank you Paul and Harriet. Back in January, when I first learned of the opportunity to travel to Vietnam for three weeks within the Coaches for College program over the summer, I thought I hit the jackpot in terms of being able to get the most out of my summer while still fulfilling other responsibilities. It’s a bit cliché to say I didn’t know what to expect, but I didn’t. Vietnam was a country that I knew little about, but what I did know is that I wanted to make a difference in people’s lives. Your first year at Harvard is often spent in this state, knowing what you want to do, but not knowing how to get there or where you’re going, and so you learn that it’s best to just any seize opportunities as ones to get you somewhere, anywhere, even if it takes you halfway around the world. So that’s what I did, I saw this as an opportunity, nothing more and nothing less, a possible stepping stone to greater discovery of myself, and of my world. Once over there, I learned that people, broadly speaking, are really not all that different from one another. We all want to be happy, although what exactly makes us happy may differ. Keeping this in mind, I’ve learned that when the culture and maybe even the privilege we are born into shapes our minds to create a virtual reality, our approach to other cultures sometimes is one of hesitation rather than acceptance. After breaking through the misconception that people of foreign countries are not foreign in their fundamental beliefs, true understanding of their culture can begin. As I continue on in life, I will surely use this approach when meeting people who I may consider much different than I am, looking at them from the inside out rather than the outside in. One of my favorite parts of my trip was being fully immersed in the culture and the country. Working with fellow Vietnamese college students, we explored the cities, ate the strangest street food, tasted the most amazing fruits, and traveled the countryside all while learning more and more about each others cultures and traditions. As I worked with the kids, they explained their holidays and festivals, some that even our Vietnamese counterparts knew little about as they were from the city and northern part of the country, rather than the southern rural part where we were based. Overall, the strangers I encountered were very friendly and open, offering a seat for a drink when you walked by, or saying “hello” to proudly show off their knowledge of English, however limited. Often times, they were so friendly when we communicated that I forgot language was a barrier, I went through life for those 3 weeks using hand motions and gestures, everything flowing smoothly, but had the simplest trouble ordering water or asking where the restroom was at times. Overall, these challenges were overcame quickly, with just a bit more persistence or creativity, if not for the help of an Vietnamese student acting as a translator. Career choice wise, I now know that I want to help people. Working with children who may never have the opportunity to achieve higher education to truly reach their dreams sadness me, but it is something that is happening all over our country, and our world. I’m very excited to continue on with my studies here at Harvard, with the aim to help those who need it most, the disadvantaged, to have the same ability and possibility to achieve their dreams. I would like to thank the Wiessmans for their very generous donation to enable me to experience such an opportunity this summer. I had an outstanding time, and learned more about myself and this world than I ever thought I would. 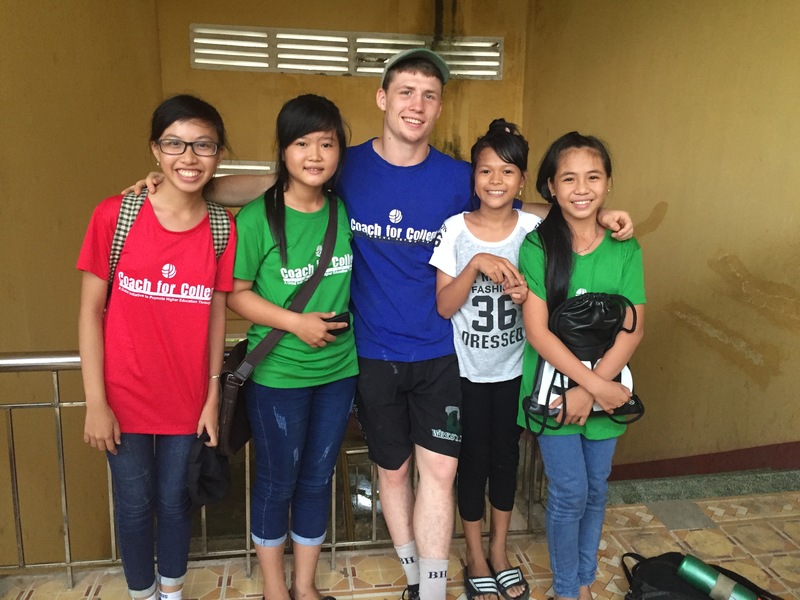 I hope you continue to support the Coach for College program as it truly changes lives of Harvard student-athletes, as well as school-kids in rural Vietnam. I applied for Coach for College mostly on a whim in early January. In the throes of preseason training, I realised I hadn't yet organised anything for my upcoming freshman summer, when I remembered an email I had received a few months earlier from J.P. O’Connor at the Harvard Varsity Club. Rereading the information about coaching high school children in Vietnam while attempting to inspire them to pursue higher education, I imagined myself having the opportunity to widen my perspective on the world and experience a cultural environment different to anything I’d seen before. I don’t have any aspirations in teaching or education, but I have considered pursuing a career coaching sport, and so this did give me some more experience applying those skills, even if it wasn't in a high level sporting environment. What I didn't anticipate, however, was the incredible bonds I would form with my co-coaches, and the unity we felt as a team, regardless of personality, college, or most importantly, nationality. As the camp progressed, both the Vietnamese and American coaches alike began to feel more and more comfortable with each other, such that our downtime was spent almost equally with both groups. 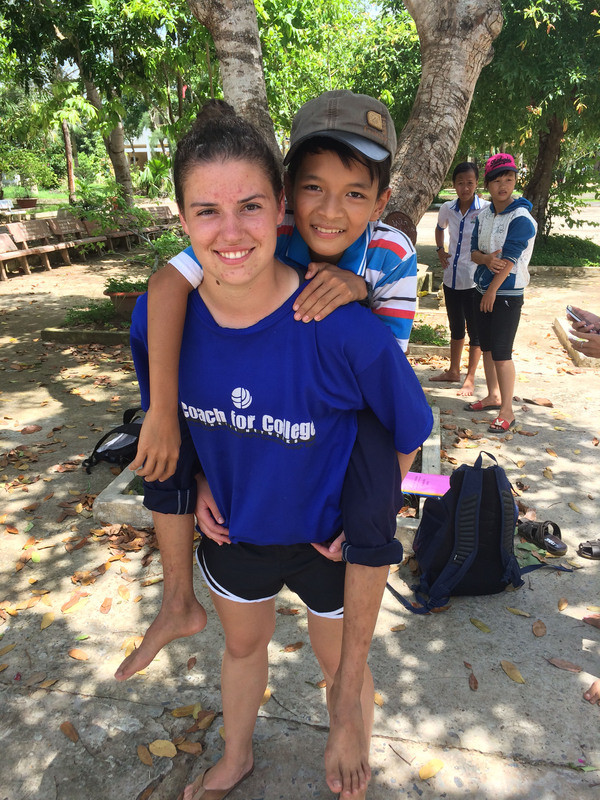 This meant that the programme was a true cultural immersion, as our days were spent surrounded by Vietnamese children and coaches, the amazing communitarian culture, and the surprisingly accessible language. These day-to-day cultural experiences were bolstered by the weekend trips included in the programme, which featured two days in a nearby city called Can Tho, where we completed an “Amazing Race” style scavenger hunt around the unique floating markets, architecture, and cuisine of the city, as well as an evening of the nightlife activity of choice in Vietnam: karaoke. The main lesson I learned from my time in Vietnam was aptly summarised by one of my co-coaches. He pointed out how, when you ask fellow students how they are during the daily grind of the semester, it often seems like people are competing to sound the most busy or stressed out. In contrast, despite the hard work and long hours required of us, I never once heard anybody complain or bemoan their situation. Our team functioned because nobody wanted to be the one to drag the team down, even if we were all actually feeling quite similar. It is very easy to lose sight of all the incredible opportunities we have at Harvard, and the weekly reflection sessions built into the programme helped me to see that perhaps the most important aspect I can take away from my time in Vietnam is to remember to be present and cognisant of all that I am lucky enough to be able to do at Harvard. Instead of allowing the grind of Harvard to become a strain that keeps my eyes to the ground in front of me, I have learned to remember to look up, and actually take it all in. It wasn't so long ago that Harvard was somewhere I could only dream of being, and for the children I taught - and hope I was able to impact even a little - it is a million miles away from even their wildest dreams. It is far too easy to lose sight of that, and to do so would so completely fail to do justice to the opportunity we are lucky enough to have. I would like to thank the remarkable generosity of the Weissman family, who have not only made a truly transformative experience possible for so many enormously appreciative students, but have also changed the lives of many Vietnamese children and coaches who I hope have had their perspective on the world widened beyond the horizons they had previously perceived. In two camps, I taught or coached over one hundred children between the ages of 12 and 15. The stated purpose of Coach for College is to inspire these children to stay in high school, and ultimately pursue higher education. For many of these children in rural Vietnam, their dreams are to simply make it to the big city, just five hours away. As such, the impact of 12 foreign coaches transforming their perspective on not just education, but on the boundaries of what they truly can achieve in their lives cannot be overstated. For this, I, and all the countless people affected by Coach for College, are truly grateful. Thank you. As an aspiring teacher, Coach for College provided me the opportunity to improve my teaching skills, and explore the career path further. I envisioned the language barrier as being more of a burden than it was. While some concepts were unable to be transferred without translation; empathy, humor, and the dream of something greater, were universally understood. I had the opportunity to practice the important skill of lesson planning for the first time during my time in Vietnam. I was given the opportunity to explore this and other aspects of teaching that I had not considered prior to this trip to Vietnam. Thanks in large part to this incredible experience, I am moving forward towards being a high school teacher after graduation. Having never been to Asia, I decided that on this trip it was imperative to say yes to as many experiences as possible. On my first full day in Vietnam, I found myself eating my words, and balut, a delicacy in Vietnam that is essentially duck veal in hardboiled form. After this experience the ice was broken, I rode through the jungles of Thailand on motorbike, participated in Sri Lankan dance, and rocked traditional Vietnamese garb the whole time. What I reminisce on more than any single experience is the uniformity of our human species. I traveled a little bit on my own after Coach for College ended (to Thailand, Sri Lanka, and Dubai), and throughout each distinct culture, I realized that regardless of background, religion, or race, we’re all the same. The same music makes us dance, the same worries make us anxious, and the same faces make us laugh. At the core, we’re all decent, kindhearted people. If I am serious about teaching, I understand that I must pick a subject that I want to teach. This coming school year, I plan to take courses in both English and Science to bolster my case for being a great secondary school teacher. I also plan to take a couple course on pedagogy to see if I can identify some area that I am strong as a teacher and some areas that might need work. Cross-registering with HGSE would also allow me to learn some useful teaching tactics. To Mr. and Mrs. Weissman - Spending a portion of this summer in Vietnam has helped shape me into a better version of the person I used to be. I now know that I want to make a difference in the lives of the youth of the nation and the world. I had very many influential teachers growing up, and I have decided to strive to be that person for others. Coach for College has allowed me to search deeply and explore the question of what is important to me. I believe that one of the greatest positive influences that I can have on others is within the classroom. This conclusion would not have been realized if not for the opportunity that the two of you have allotted me. You have set me on a positive trajectory, one that I plan to continue moving forward as I transition out of college and become a contributing member of society. Thank you for what you have done for me, for others, and what you continue to do. Your generosity and kindness is making a huge difference! Before I began my journey to Vietnam, I expected to dabble in some Vietnamese culture, learn perhaps a few superficial aspects of their traditions, and maybe get close to one or two students. 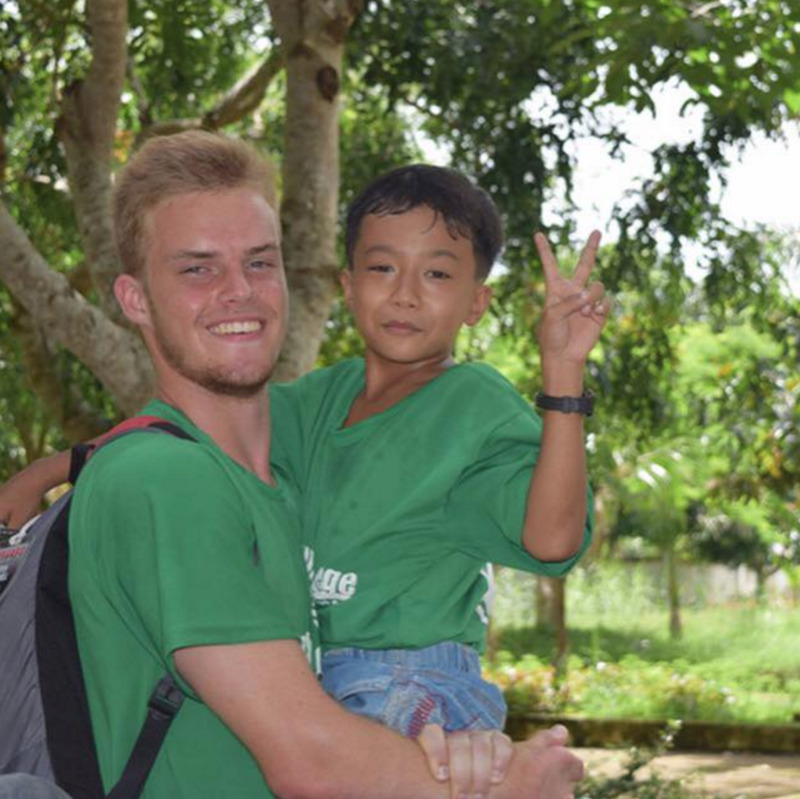 I honestly thought that I would walk away from this program with very little impact on the Vietnamese children. I was very wrong about my expectations. First of all, I did more than just teach biology and tennis to the children; I was able to persuade many of them that education is very useful in everyday life. I was surprised when the children rode their bikes by our guesthouse and told me that they were excited for my demonstrations in class. I was even more taken back when I was able to change girls who started the program refusing to participate in the sports section to girls who competed head-on with the boys in the camp. As for the “dabbling” in Vietnamese culture, we lived in a guesthouse ran by a nice Vietnamese family in the middle of the countryside. We often would stroll/run along the pebble road alongside the river. On one of our walks, a family having dinner offered us eggs with unborn chicks in them. I would highly recommend anyone who isn’t a big fan of eating feathers to not try the egg. 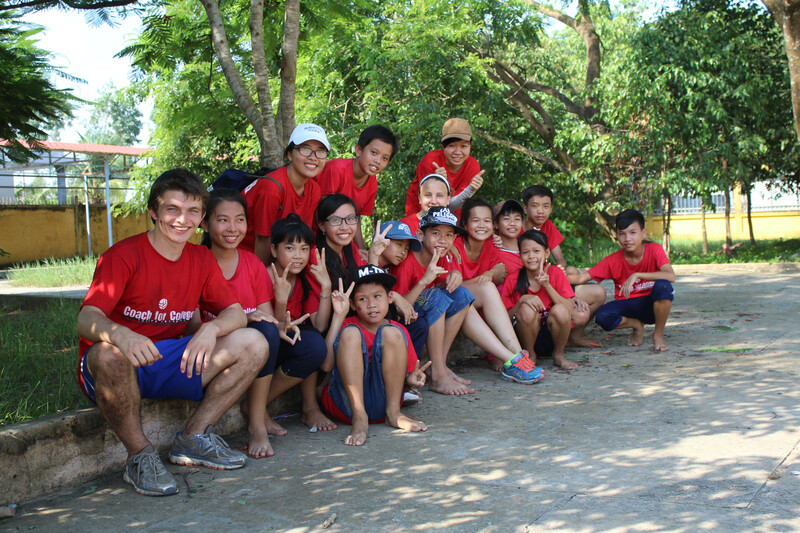 Our camp also took weekend trips to different locations in Vietnam. Our first night in Ho Chi Minh City, I was shocked by the intensity of the night market. People would grab your arm to try to get you to buy their product. My first time bargaining with the vendor wasn’t as successful as the other coaches, but I was still able to buy a pair of elephant pants for less than $3. My favorite trip was when we went on a scavenger hunt in Can Tho. The people were much nicer than Ho Chi Minh! They were much more patient when I tried to ask for directions in my newly learned Vietnamese. We also had more time to venture in the city, and I was able to try a large variety of fruits from the street vendors. Additionally, we visited many temples, which opened my eyes to the importance of Buddhism for the Vietnamese. It is always interesting to see the differences that arise from believing in different religions. Now that I have been back States-side for a month, I have reflected much on my experiences in Vietnam. My main take away from this trip is that regardless of the cultural differences and the language barriers, everyone understands effort, and they respect it. When one takes the time and effort to learn someone else’s culture or language, the gesture is mostly reciprocated. Effort has the power to inspire others. From my experiences in Vietnam, I now feel more confident in stepping out of my comfort zone. I now aspire to backpack in a foreign country to once again immerse myself in another culture to gain a more holistic view of the world. I want to thank Paul and Harriet Weissman for making my trip possible! Thank you for giving me the opportunity to have my eyes opened by another culture and for widening my perspectives of this world.